I have a wonderful client who’s ordered many cakes, cupcakes and cookies from me in the past few years. 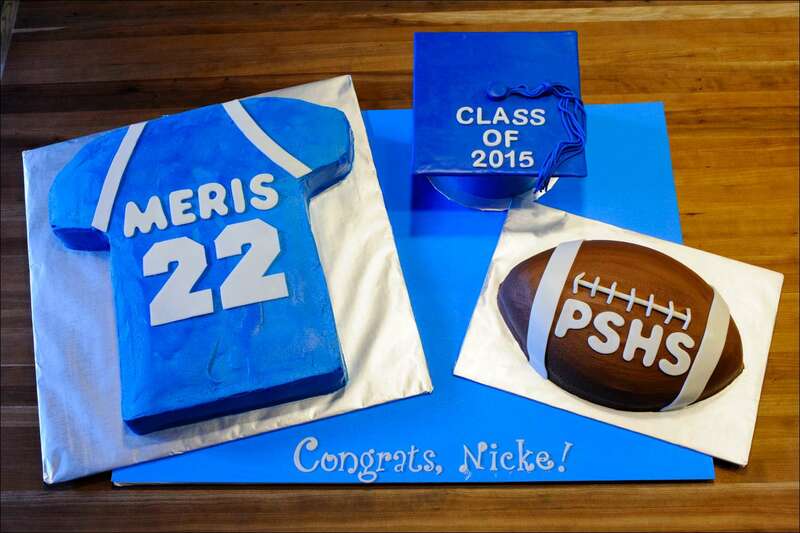 This last spring, she came to me with an order for her son’s graduation party…3 cakes with a football theme. 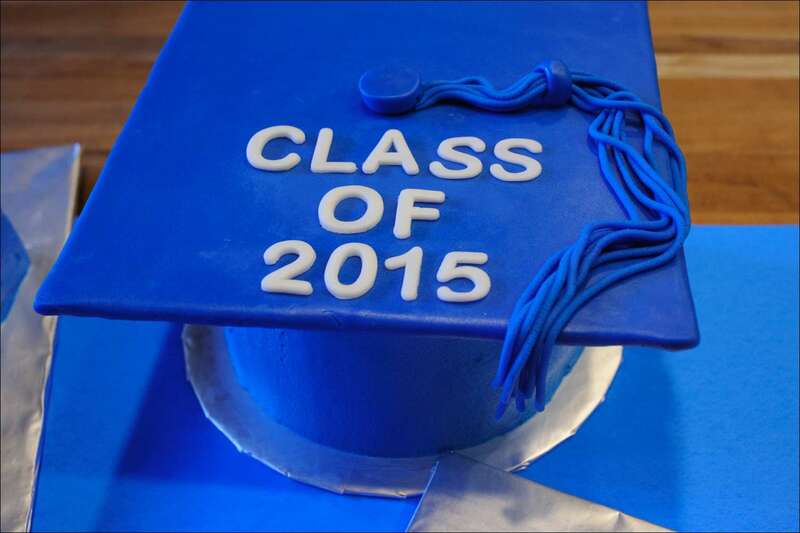 She sent me a picture of a cake display of 3 cakes showing a graduation cap, a jersey and a football. 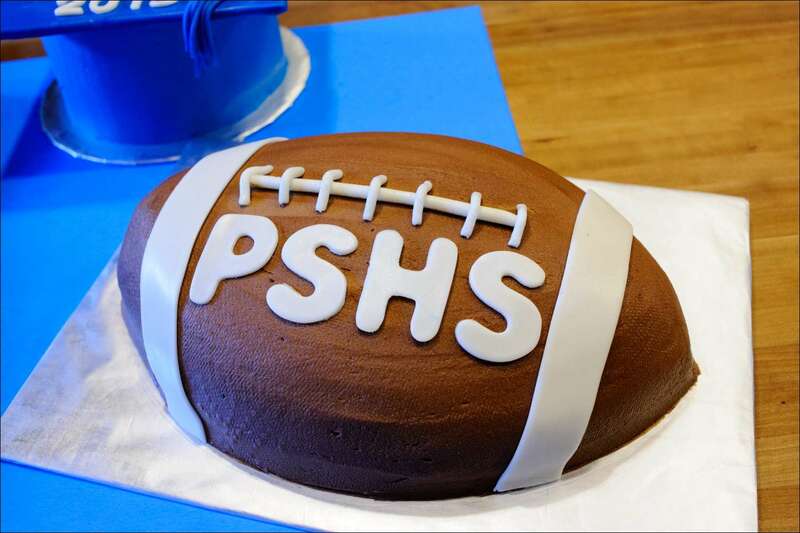 So I got to work… The football I made from chocolate cake with raspberry filling baked in a Wilton football-shaped pan. I smooth iced it with chocolate buttercream…then when it had crusted a bit, pressed a textured paper towel over it to give it that “pigskin-like” look. 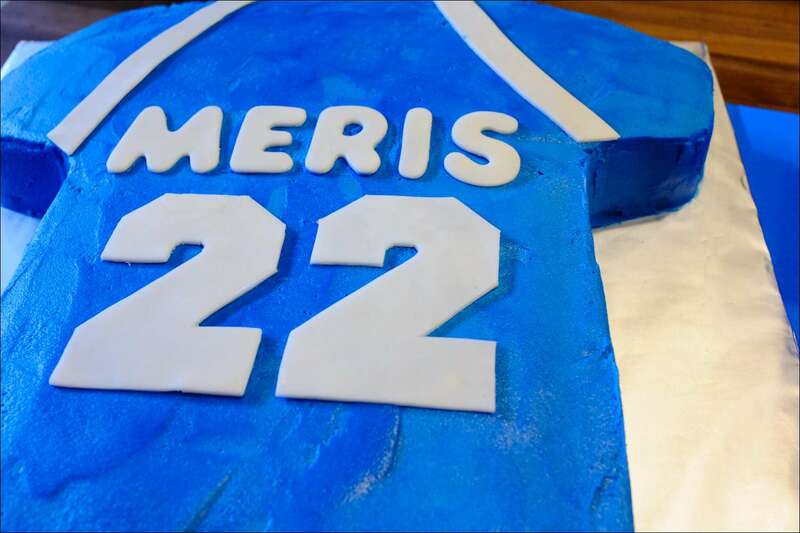 The letters, stripes and seams are homemade marshmallow fondant. The letters I cut with cutters I had from a cookie making kit, the stripes with this neat-o Sugarcraft ribbon cutter like this one, and the stitching I made with a Walnut Hollow clay extruder I got just for this order (but have used a bunch since). 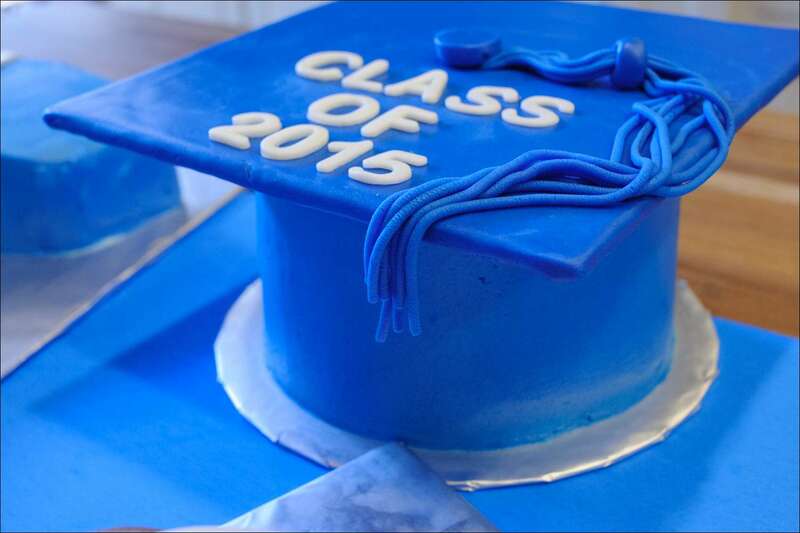 The graduation cap was a 6″ banana cake filled with bavarian cream filling. 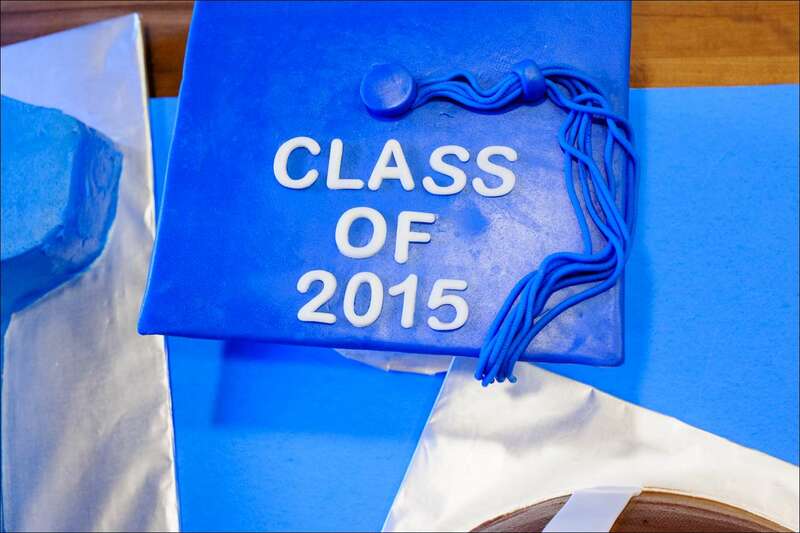 I cut an 8″ square out of stiff cardboard and covered it with homemade fondant colored blue, added tassels made from blue fondant (again, extruded with my neat-o extruder) and a button on top. 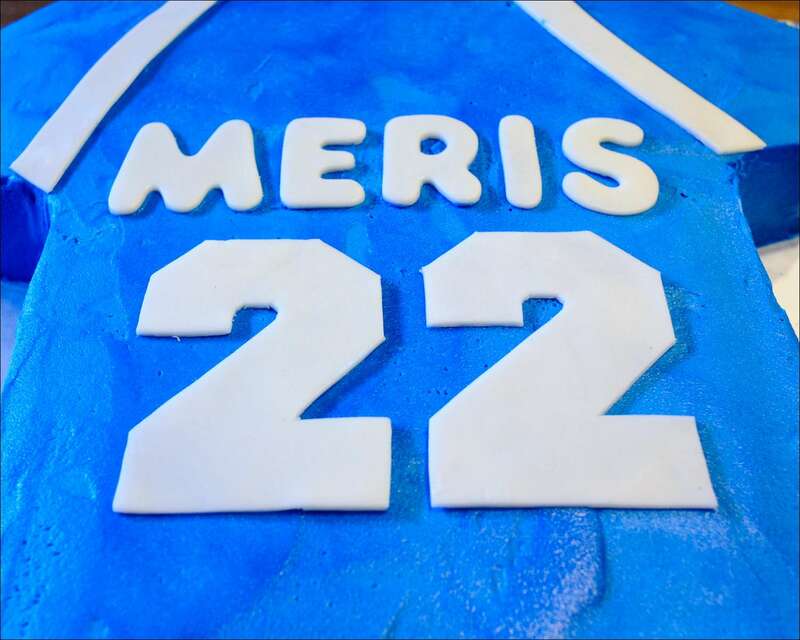 The cake is iced with blue vanilla buttercream colored to match the fondant. The letters and numbers are cut from white fondant with these easy-to-use Wilton letter cutters. The jersey is made from a half-sheet pineapple mandarin cake (sometimes referred to as Hummingbird cake) with a pineapple cream filling. I cut it to resemble a jersey with a template I made from cardboard. 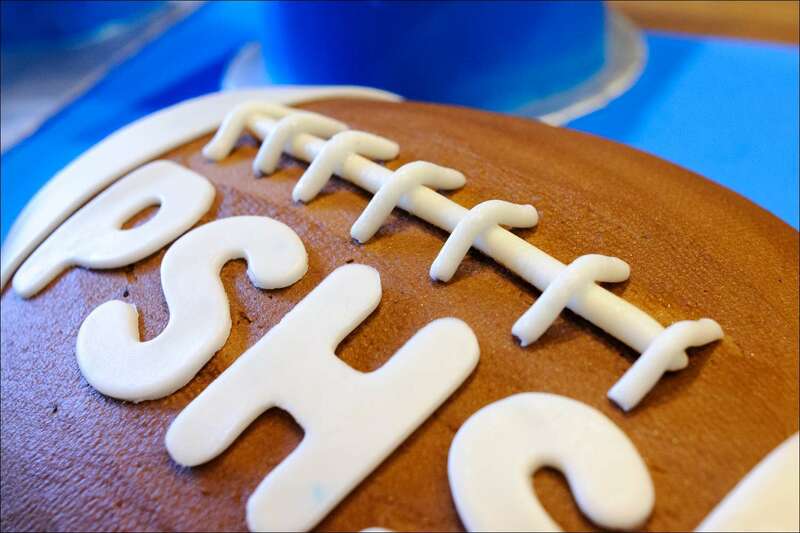 It’s iced with the same blue buttercream as the cap and the letters are cut with the same cutters as on the football. The “22” I hand cut using a template with a “collegiate font” to look more like sports numbers. I put the cakes on separate boards for ease of handling and transport. The larger board is a foam-core board I covered with blue poster board. The congrats message on the board I cut using Tappit Funky Letter cutters, glued down with a little piping gel. That’s about it! 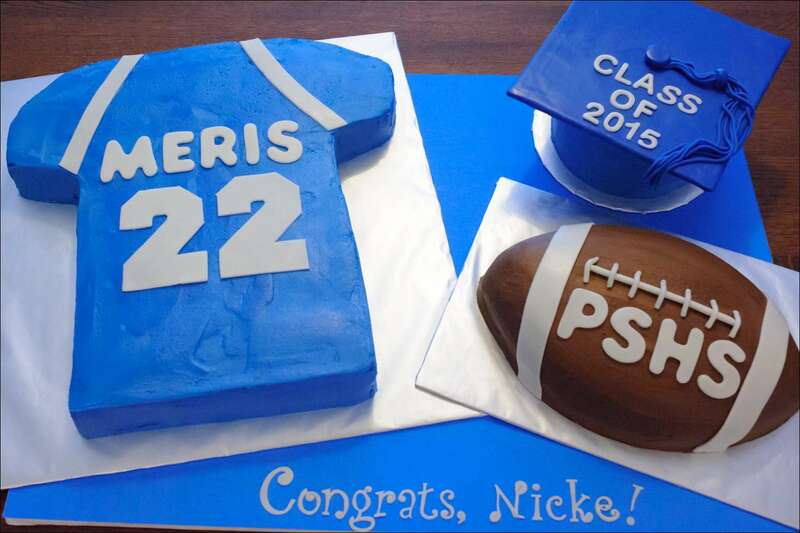 Hope you had a great party, Nicke, I sure had fun making your cakes!